One bomb of a Microsoft hardware leak has just dropped from an unlikely source: the final chapter of a non-fiction book penned by a technology journalist. Beneath a Surface, the debut book by Brad Sams, the blogger and podcaster behind technology website Thurrott.com, is available now in ebook format, and it contains lots of information on the future of Surface, Xbox and even the long-rumored Andromeda device. Speaking to anonymous sources familiar with Microsoft’s plans, Sams learned of an entire hardware product roadmap in place for 2019 and 2020. 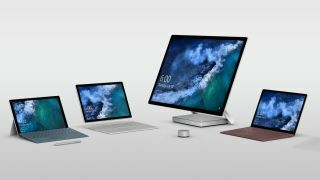 Specifically, he writes that the next Surface Pro tablet will finally bring USB-C connectivity, as well as adopt smaller screen bezels, rounded corners and several new color options by the end of 2019. As for the next Surface Laptop, expect to see one running on an AMD processor with Radeon Vega graphics around the same time as the new Surface Pro, according to Sams. Meanwhile, the future Surface Book product won’t arrive until 2020, Sams’s sources say, with little more information than that. However, expect a revamped Surface Studio all-in-one PC to launch in the same year, which may have more in common with the Surface Hub whiteboards than previous Studio designs. 2019: the year of Xbox and Andromeda? Sams’ book also teases out information from sources regarding the Xbox One’s future roadmap, as well as a bit more about the long-fabled Andromeda device. First off, if Sams is right then you can count on seeing a duo of new Xbox One S consoles for 2019, particularly one model that might be 100% digital, with no disc drive. This at least corroborates similar reports published earlier this month. Finally, Sams claims to have learned that Andromeda – the long-rumored dual-screen phone-like productivity device – could be in our hands by the end of 2019. Furthermore, we can expect the device to be larger than previous reports have suggested, and to be closer in terms of functionality to a PC or laptop than a smartphone. Sams’ report-within-a-book delivers a dump truck worth of grist for the rumor mill – and if there's substance to his claims then Microsoft is set to have a busy 2019 and 2020 in terms of hardware launches.